What is the difference between celiac disease, gluten intolerance, gluten sensitivity, and gluten-free? Celiac disease is an autoimmune disorder, meaning the body attacks itself. In the case of celiac disease, the body’s immune response kicks in when gluten, a protein in wheat, is eaten causing the villi – fingerlike projections lining inside walls of the small intestine – to be damaged. Villi is where most nutrient absorption occurs, so when these cells are damaged, the nutrients from the foods eaten don’t make it into the bloodstream very effectively. People with untreated celiac disease may also have nutrient deficiencies because of the damaged cell walls of the small intestines. People with celiac disease are gluten intolerant, but not everyone who has trouble tolerating gluten has celiac disease. An intestinal biopsy, a procedure done in a doctor’s office, is the only way to confirm a celiac disease diagnosis. 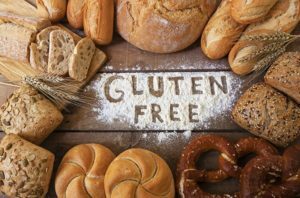 People without a positive diagnosis of celiac disease but who fare better following a gluten-free diet are considered to have non-celiac gluten sensitivity (NCGS). There is no official diagnosis or test for NCGS. Gluten-free is the diet that people with celiac disease need to follow. Eating even a tiny amount of gluten can be enough to kick off the immune system response. Generally speaking, foods that contain fewer than 20 parts per million (ppm) of gluten, or 0.002%, can be labeled gluten-free. Is celiac disease a gluten or wheat allergy? No, celiac disease is an autoimmune disease meaning the body attacks itself and destroys its own cells (in the case of celiac disease, the cells destroyed are in the lining of the small intestine). A wheat or gluten allergy would be a different kind of reaction in which the immune system overreacts to a trigger and results in hives, rashes, sneezing or in rare cases, anaphylaxis (a state of shock often accompanied by difficulty breathing). Wheat allergy is not uncommon, and about 65 percent of children outgrow a wheat allergy. Celiac disease cannot be outgrown. The symptoms of celiac disease are varied and not always specific to celiac disease, making it hard to diagnose. Some of the more common complaints are abdominal pain, diarrhea, constipation, fatigue, joint pain and mental fog. Some people present no symptoms at all. How do you know if you have celiac disease? A doctor can do a blood test to screen for celiac disease. The test screens for antibodies in the bloodstream. A positive result on a tTG-IgA test (tissue transglutaminase antibodies) will suggest celiac disease may be indicated. A person must not be following a gluten-free diet in order to have an accurate test result. Genetic testing may also indicate one’s risk for celiac disease, but it’s important to note that neither the blood test nor genetic testing is a diagnosis of celiac disease. Only that can be done via an intestinal biopsy. This is often an outpatient procedure, done by inserting an endoscope down the patient’s digestive tract and taking a sample of tissue from the small intestines. Approximately 0.5 to 1 percent of the US population has celiac disease. Gluten is a protein in wheat, so any wheat foods would have gluten. That includes bread, pasta, crackers and some cereals. It also includes soy sauce, some salad dressings and other foods. The best place to look for gluten-containing ingredients is to check the ingredients list on a food package. Isn’t a gluten-free diet healthier? A gluten-free diet should only be followed by people who cannot otherwise tolerate gluten. As it is, gluten-containing foods tend to be good sources of fiber, B-vitamins, folate, iron and calcium – all of which are essential for the diet. People following a gluten-free diet would need to get these nutrients from other food sources. That’s why it’s especially important for people on restrictive diets such as gluten-free diets to have an otherwise well-balanced diet with plenty of fruits, vegetables, high-quality proteins, legumes and gluten-free grains such as rice, quinoa and corn. Oats are also naturally gluten-free, but they can be contaminated in processing. I’ve heard that gluten may not be the cause of non-celiac gluten sensitivity. Is that true? There is some emerging evidence which suggests that it’s not the gluten in wheat that triggers gastrointestinal distress associated with non-celiac gluten sensitivity, but rather it’s the FODMAPs in food. FODMAP stands for fermentable oligo-, di- and mono-saccharides and polyols. These are carbohydrates in certain foods that are poorly broken down in the gut, leading to fermentation instead of digestion. The fermentation then causes gastrointestinal distress such as bloating, gas and diarrhea. High FODMAP foods include onions, garlic, beans, many fruits and fruit juices, sausage, wheat and dairy. There’s some evidence that following a low-FODMAP diet for a while then slowly reintroducing some higher FODMAP foods can help people enjoy their favorite foods once again.